Papillon has been part of the engineering industry since 1989. Our quality design expertise across an extensive range of products is the hallmark of our ongoing success. Papillon has offices and representatives located throughout the world in London, Paris, Singapore, Melbourne, Sydney and Brisbane. 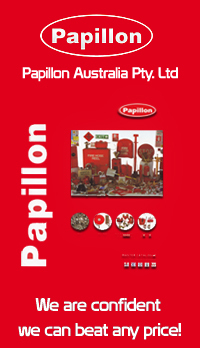 Papillon has been a major supplier to the Fire Industry for over 24 years. Supplying the full range of Fire extinguisher accessories, Fire Protection Equipment, British Instantaneous couplings and fittings,External Lug quarter turn ULC marked/listed couplings and fittings , Storz couplings and fittings, Hydrant Valves , Hydrant Boosters , Fire drip torches, Fire cabinets, Safety signs and a variety of other associated items. We focus on quality products, great prices and fast delivery. We don't charge for artwork or tooling on nameplates and signs. In order to get better prices for large quantities we allow for a Blanket Ordering System – you order the quantity you need, we store it for you, and you are only invoiced for what is delivered and when it is delivered. © 2013 Papillon Australia Pty. Ltd. All Rights Reserved.